When cartoonist Paddy Reece drew his bearcat for the campus newspaper in 1914, he wasn’t really thinking ahead to the future mascot. He just wanted a play on words for Teddy Baehr in UC’s football battle against the University of Kentucky’s Wildcats. Of course, the result was a “bear-cat,” a term already familiar to many Americans from Tin Pan Alley music and an automobile. Certainly, the binturong was in nobody’s mind except, perhaps, a zoologist sequestered in his laboratory and who was familiar with ugly and smelly Asian mammals. This 1922 logo is the earliest on record with a "Bearcat" incorporated into an institutional logo. There was no concerted effort to portray the bearcat in the years immediately following Reece’s cartoon, so the idea of what a UC Bearcat should look like was rather nebulous. It should, of course, be somewhat ferocious since it did have the word “bear” in it. And that is exactly how the image began. 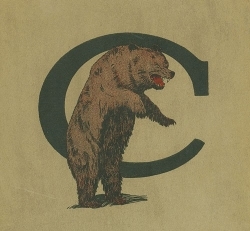 In 1922, UC’s Bearcat was indeed a bear, rearing up on its hind legs with a snarl on its face and a giant “C” behind it. The bear incarnation of the Bearcat was in place for several years, even to the point of using a live bear cub mascot from the Cincinnati Zoo. By the close of World War II, however, the notion of what the Bearcat should look like changed from a very lifelike animal to a cartoon of a squat growling bear with long claws and whiskers. 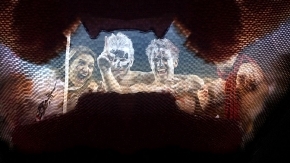 And, on decals, posters and other promotional material, it was colored UC red. 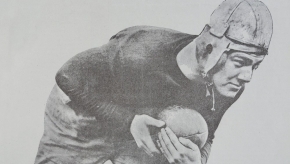 By the 1950s when a select student began dressing as a mascot for football and basketball games as well as campus events, the costume featured a Bearcat in a fan-friendly mask with a smile on its face. 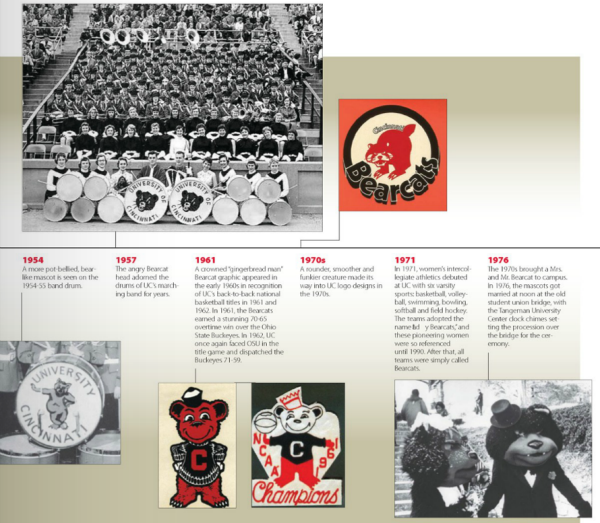 No longer fierce and dangerous, the Bearcat was now tame and just “one of the guys.” The campus yearbook, The Cincinnatian, carried cartoons of this new Bearcat that variously showed it in student and professorial surroundings. By the end of the decade, more cat-like aspects were added to the look, but it was still smiling and accommodating, even as Oscar Robertson and the basketball team were tearing apart opponents on the hardwood, much as if their opponents were caught in the woods — by a bear. 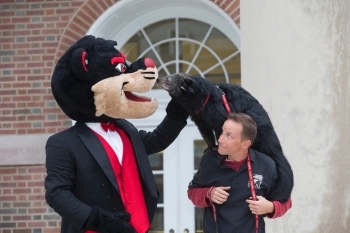 Today's Bearcat mascot and "Lucy" from the Cincinnati Zoo did some bonding during the 100th birthday party of the name Bearcats in October 2014. Lucy's trainer is Eddie Annal. Through the 1970s, this image continued, but by the 1980s, the Bearcat, with even more feline features, had the snarl return. And for the first time, a binturong from the zoo was leashed around at games, now that zoological reality hit campus. 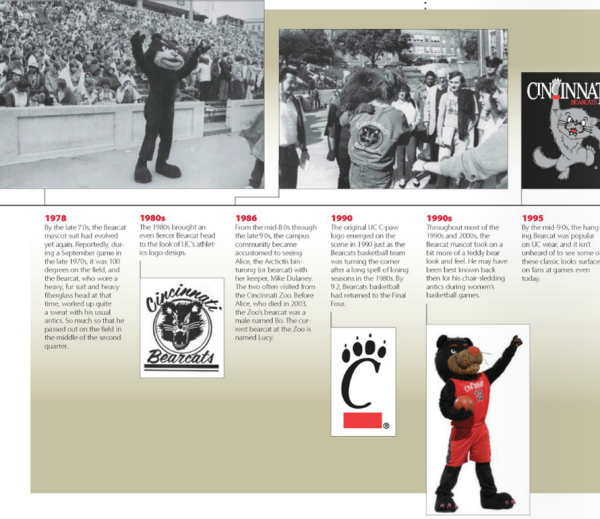 In the years since and up to today, there was recognition that UC needed three renditions of the mascot, one that was used for a student costume and emphasized both “bear” and “cat” characteristics, and a second cartoon image that was on first glance rather growly but then came off as an angry kitten. This image was mostly geared toward children and souvenir sales. And the third, though a more abstract iteration, was the C-paw graphic, again representing the competitive nature of the sports teams. The 15-foot Bearcat statue that was erected on campus in 2010 embodies the binturong, the bear and a growl. 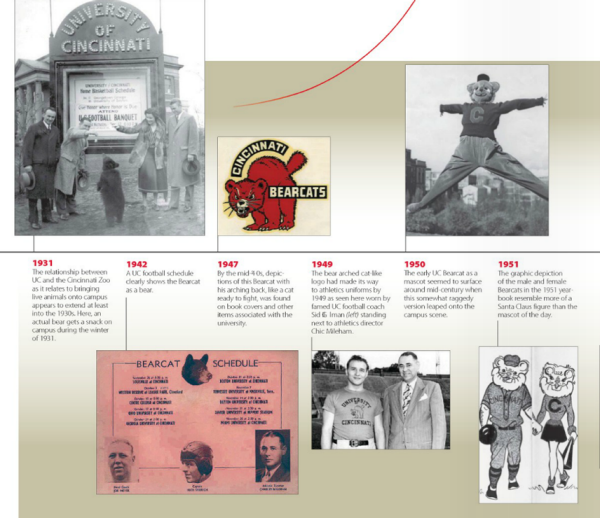 All three manifestations have come to singularly identify the Bearcat as a key symbol of the University of Cincinnati. Kevin Grace, MA (A&S) ’77, is UC’s head archivist and an adjunct assistant professor for the University Honors Program. 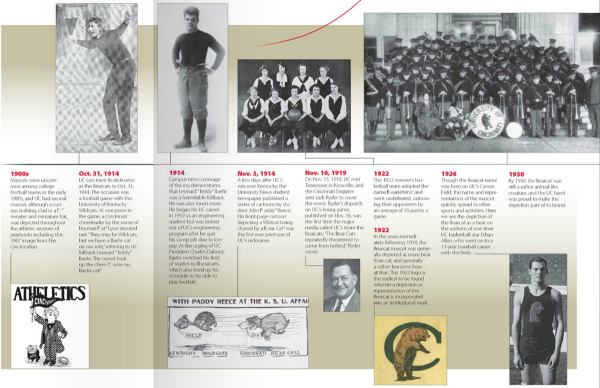 A century after the original Bearcat inspired his team’s name, Teddy Baehr’s legacy extends far beyond the football field. One alum has been strumming his guitar and turning heads as NYC's famous Naked Cowboy. 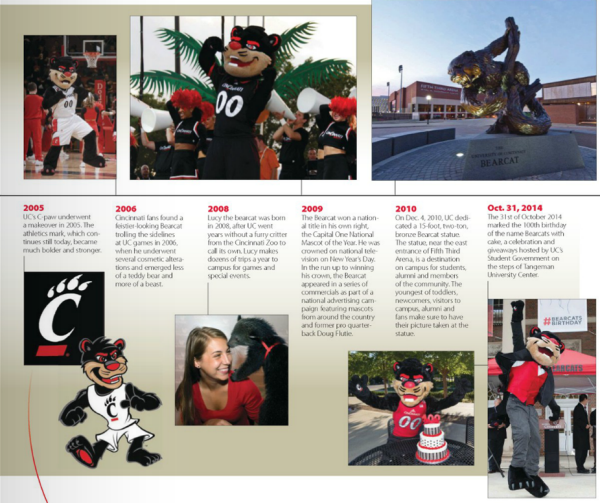 Graduates share some of their favorite memories from their days as the Bearcat mascot. 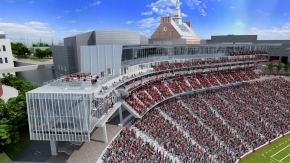 Previewing the upgrade of UC’s historic Nippert Stadium set for 2015 home opener.